Erm hello…? What is with this weather?! So glad I bought a sun parasol recently(!). And the one of the worst things about a grey, rainy, horrid week in summer is that you end up going cold turkey on your Vitamin D and feel like killing yourself and everyone around you. Or is that just me? A little bit of browsing for things that I don’t need will surely cheer me up. Or perhaps not. How gorgeous is this vintage bird brooch from Maison Ami? I spotted it while killing a bit of time at work sneakily reading one of my favourite all-rounder blogs Domestic Sluttery, a blog for people who want to do stuff, buy stuff, cook stuff and drink stuff at the same time. It has caused me to spend money in the past though. 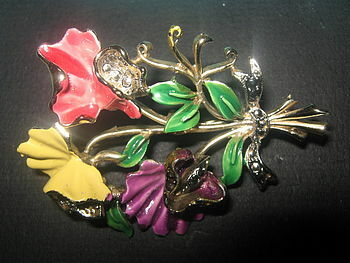 Another little beauty is this vintage Sweetpea piece from the 1950’s. Either of these would be the perfect thing needed to brighten up a slobby outfit of skinny jeans, t-shirt and flats (which I am currently wearing because I can’t cope with the thought of more rain. If only I had wellies…). That’s not a slobby outfit. I’m currently wearing a big t-shirt AND ORANGE HAREM PANTS. Shoot me. Ha! 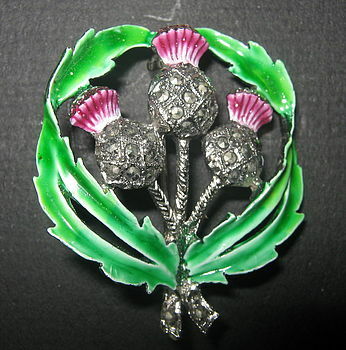 I love that the last brooch might bring out your inner Braveheart!! 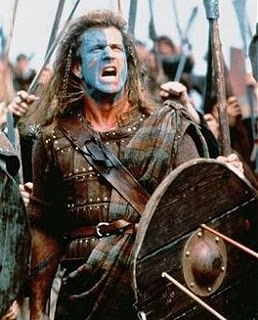 Being an English girl in the land of Jocks I’ve seen a lot of Braveheat behaviour, I too blame the weather! 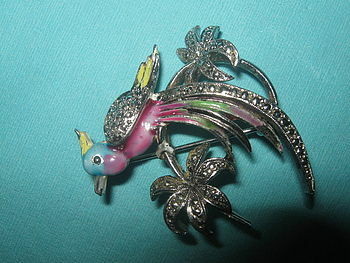 I adore the vintage bird brooch!! I have been trying to soak up as much sun as possible today as I have no idea when I will get the chance to again. Stupid lack-of-summer!